Barcelona attracts art, literature, and music lovers every day, but a blend of all three brings me to streets full of red roses, Shakespeare, and song on April 23rd. On that day, the annual feast of Sant Jordi, visitors flock to the Mediterranean seaport that inspired Picasso and the famed Spanish architect, Gaudi. Though I'm a solo act today, I'll celebrate Catalonia's patron saint on a day that also recognizes a noble dragonslayer and marks the deaths of two literary lions. With a potpourri of bookish events, roaming musicians and a chance to dance later, I join the intergenerational throng. Today everyone is Catalan. Visitors flock to the annual Sant Jordi Festival in Barcelona, Spain. The legendary Sant Jordi (Saint George) got the rose tradition started when blood splattered by one of his defeated fire-breathing foes sprouted into a rosebush. As the story goes, the chivalrous saint bestowed a sanguine blossom on his recently-rescued princess. Where I live, roses are the gift of choice on Saint Valentine’s Day, but in Barcelona, the April 23 date has been in place since the 15th century. Since dragon rescue is rarely required, 21st-century men retain their hero status by buying 6 million long-stemmed, perfumed beauties in one day. Señoras and senñoritas stroll Las Ramblas and Passeig de Gracia with bouquets in hand. My only floral offer is a paper rose replica from the hands of a giddy teenager. She chortles when I accept her dubious present. Maybe I'm supposed to give her a coin, but I can't get past her giggles. Sant Jordi’s Day isn’t a national holiday, but couples and families walk arm in arm. We all listen to a dark-haired youth, as he plucks his harp with fluid grace. This neighborhood, the Barri Gotic, is a magnet for street performers. Just steps from every flower stall, booksellers line the famous shopping districts, hug narrow passageways and dot the city squares. Festooned with the red and yellow of the Catalan flag, bookstalls pay tribute to Miguel de Cervantes and William Shakespeare, as both died on the same day, April 23, in 1616. Even though it’s more than 400 years since Don Quixote was published and things have changed considerably, I love knowing parts of the classic were set in Barcelona. This vernal fiesta is also known as The Day of Lovers, so women shop for the perfect books for the men they love. And to nurture myself, I purchase a Catalan-language children's picture book to add to my international bookshelf back home. 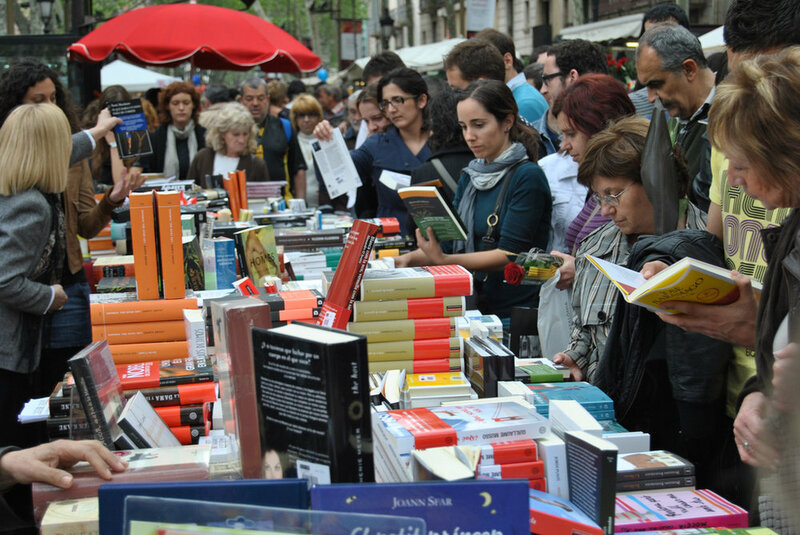 UNESCO designates April 23 as International Book Day and local officials estimate more than 400,000 books will be purchased in Barcelona, so booksellers and book buyers abound. Mysteries, cookbooks, meditation, how-to, and fiction for young and old are among the carefully wrapped packages carried home before the petal-strewn streets empty. International Book Day (April 23) is celebrated as part of the Sant Jordi Festival in Barcelona. Photo by Jordi Garcia /Flickr CCL. Especially prized are the Catalan-language volumes. The region’s native tongue has undergone periods of neglect and suppression. From 1939 until the early 1950’s, the Franco regime forbade the printing of books, magazines or newspapers in Catalan. Though there are discussions of separation, the people in this northeast corner of Spain, certainly view themselves as a "cultural nation." It’s ironic that in the 1920’s when Barcelona publisher Vincente Clavel proposed a day to honor books, he focused on Cervantes, a Castilian writer. It wasn’t until 1926 that books were honored on the same day as Catalonia’s patron saint. During the decades when their language and customs were suppressed, the Barcelonans embraced Sant Jordi’s Day with extra vigor. Now, alongside roses and street performers, local publishers and bookstores host authors and illustrators, many of them available to autograph their work. But besides my hunger for books, I also want to sample delectable treats at cafés and chocolatiers along the way down the Avenue del Porta de L’Angel. And I drink in the music of the blues guitarist who staked out an alley across from my table as I enjoy my coffee con leche. Then I imbibe the voice of the barrel-chested baritone who sings on the steps of the Archdeacon’s House. He moves his audience to tears. I curtsey and he bows as I deposit my meager tribute in the tin beside him. From there it’s two steps up into the chapel of Santa Lucia for a turn around the Cathedral of Santa Eulalia that dates to the 13th century. It’s soothing to visit the cloister, even though there's a gaggle of loudly chorusing geese in residence. I consult my watch to make sure to arrive in the Placa Sant Jaume by early evening. All the other music fades away as prosperous-looking matrons and dignified men greet each other in the historic square. The air is still perfumed with roses, and at a different time, they could be assembling in an elegant drawing room. Instead, they are sandwiched in between stellar examples of Gothic and Renaissance architecture, watching, waiting. Under the benign gaze of the statue of Sant Jordi, a small band, called a cobla, climbs onto a temporary stage. The crowd grows still. It is time for the Sardana, the folk dance that defines Catalonia. The first notes come from the flaviol, a tiny high-pitched flute. Then the brass begins. Finally, the strings connect the haunting melody. Spontaneously, men and women in the crowd join hands and form circles. They pile jackets, purses and shopping bags in the center of the circles as the human circumference grows. Their step is light, deliberate and utterly joyful. No one is a bystander here; those who do not dance begin to sing softly. Sardana, a traditional Catalan dance. Photo via SHbarcelona.com. Beneath the music and movement, the oblong stones rest where Barcelona’s Roman forum once stood. I am swept into the magic of past and present. Faces shine with pride and pleasure as the dancers move to left and right. They raise their hands high in homage to Sant Jordi and the proud people of Catalonia. Learn more about Barcelona's Sant Jordi Festival. View Barbara Wysocki's photographs of her Sant Jordi experiences. With footsteps on every continent, Barbara Wysocki writes about travel, art, children’s literature, and spirituality.